Last week, we talked about the features and advantages of UniNet Premium Laser Transfer Paper, which is the preferred companion product to the iColor 500 laser transfer printer. Using UniNet Premium Paper with your iColor 500 gives you the best performance in terms of softness and durability for your dark fabric T-shirt transfers. And the Premium Paper expands the envelope for high quality opaque transfers on diverse surfaces like mouse pads and wood signs. As noted in our T-shirt Printing Packages article, laser transfer is a very versatile garment decoration method, but it has a bit of a learning curve. Each laser transfer solution has it own quirks which must me mastered. With that in mind, we present these handy UniNet Premium Paper troubleshooting tips. Like the guides we’ve published for EnduraTrans and Neenah papers, this guide will help you quickly master the finer points of iColor laser transfer printing. Click past the read more button to get more laser transfer tips and tricks. In case you missed last week’s article, here are the Cliff Notes. UniNet makes a premium two-step laser transfer solution for use with their innovative iColor 500 printer. The iColor 500 has a unique five color toner system using CMYK plus Fluorescent White, with an option for Fluorescent Cyan, Magenta, and Yellow. It’s quite versatile and excels in garment decoration and small signage and other non-apparel print applications. 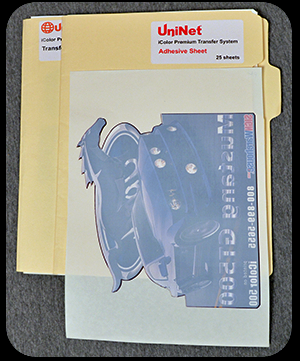 UniNet Premium Laser Transfer Paper costs a little more, but offers several advantages over other solutions on the market including faster press time, a soft matte finish, excellent opacity, and unmatched durability. The apparel transfers are rated for up to 100 wash cycles. The other UniNet advantage is the low temperature. UniNet Premium Paper works at only 260°F. This makes it an ideal solution for decorating delicate synthetic fabrics. And, since the first and second steps both work at the same temperature, you don’t have to reset the heat press between steps. No time is lost waiting for the press to heat up or cool down. If you already have an iColor 500, or are about to order one, you’ll want to start by downloading our Premium Paper user guide. This guide takes you from design to production with all the info you need to create professional quality decorated apparel. But what do you do if your prints or transfers don’t come out quite right? Well you can always call SignWarehouse Tech Support. But if you’re a do-it-yourself type, you might want to start with these troubleshooting tips. • White Layer Inverted. If your white layer is printed upside down or backwards, you’re feeding the paper incorrectly on the second print pass. This is the easiest thing to fix. Just put a small mark in the forward edge of the top sheet of paper before you print the CMYK layer. Then, when you load the sheet or sheets for the White layer, make sure that mark is in the same place. FIG 1: This print shows a registratiton problem between the White and CMYK layers. This is usually an easy fix in the design stage. • White Layer Misalignment. If your white layer is off center or slightly misaligned from the CMYK layer (Fig 1), there are two possible causes for this. The first is in the design. Any garment decoration method using a white under-base requires some finessing of the artwork to provide a margin of error for registering color over white. This is done by adding a choke to the white layer. You simply shrink it a bit so that the CMYK layer hides the white. Create the white layer by selecting and duplicating the CMYK layer. Then reduce it by about 2 pixels or 0.02 inches. If you want a white halo or border effect outside the CMYK color, do the opposite. If your layers are consistently and severely misaligned, you may be using incompatible software. For reasons yet undetermined, SAI software (FlexiSign and LXI) does not work with the two-pass process because the white layer is consistently misaligned. We recommend CorelDRAW and Adobe Photoshop for the graphic design and print phase for the “A” configuration. FlexiSign and LXI can be used to design graphics for use in the B Configuration with the iColor TransferRIP. Tip: If your CMYK layer includes vector fonts with a stroke, your graphic design application may not duplicate the stroke when you copy and flatten that layer to create the white under-base. You may have to duplicate the CMYK layer, rasterize the type, then flatten it before duplicating it to create your white base layer. This will carry over the width of the font stroke into the base layer for correct color-to-white registration. • A4 Vs Letter. If you’re doing all of the above correctly and your white layer is shifting, you may be using the wrong paper size. UniNet Premium Paper comes in A4 sheets, not letter size. A4 paper is 8.27″ x 11.7″. If you have the iColor printer driver set for letter size sheets, you may cause registration problems when you print the white layer because the printer driver is positioning it based on incorrect paper size. 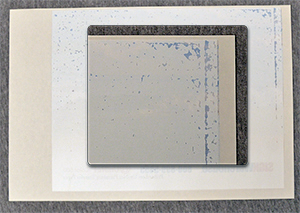 FIG 2: Here we have a blotchy adhesive coating caused by letting the paper cool before the transfer and adhesive sheets are separated. Splotchy Adhesive Coating: The first step in applying your print to apparel is to press the Transfer and Adhesive sheets together. When done correctly, this adds a layer of white adhesive to the toner, but only to the toner. 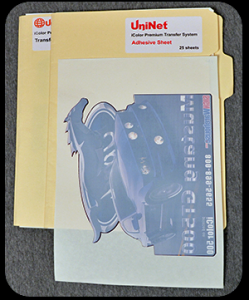 The unprinted areas of the transfer sheet remain free of toner or adhesive. This is where most two-step laser transfer users run into trouble. The most common complaint is a blotchy or inconsistent coating of adhesive (Fig 2). If you ignore this and press this transfer on a shirt, you’ll have gaps in the image where the adhesive white layer is missing. So it’s important to get this right. There are two possible causes for this problem, thus two possible solutions. 1) Temperature: If you’ve peeked at the aforementioned Instruction Guide, you may have noticed that it recommends two consecutive press cycles of 35 seconds each and it suggests placing a Teflon sheet under the press table. These steps are designed to prevent the most common problem in laser transfer; premature paper cooling. Make sure you use the two consecutive cycles and a Teflon sheet. You can also add a Silicone or Teflon wrap over the heat press table. This helps to keep heat from being absorbed into the table, which keeps the paper from beginning to cool while you’re peeling it, which prevents blotchy adhesive coats. And always, always, always, peel the sheets immediately after the press cycle and flat on the heat press table. Lifting the sheets off the table or waiting too long will cause the same problem. 2) Steady Pressure. If you have transfers that are producing inconsistent adhesive coating – especially if the problem is only on one side of the sheet, you probably have an equipment problem. 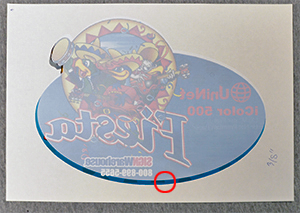 The heat and pressure must be even across the table for any two-stage laser transfer papers to work well. To verify even heat, measure across the platen with a contact IR Thermometer and make sure it’s in the desired range all around. If not, adjust the temperature or upgrade your heat press. The other problem may be inconsistent table pressure. Clam shell presses and convertible presses sometimes produce less resistance to the platen in one area of the table. This uneven pressure may affect the bonding of the adhesive layer and produce a splotchy or cracked adhesive coat. If you’re seeing this consistently, change to a press with a more stable table. The EnduraPRESS SD20, Knight DK20S, Hotronix Fusion, Knight DK20SP, or Hotronix Air Fusion are all great platforms for white toner laser transfer. Laminator Solution: Although we haven’t felt the need to use it here, the experts at the UniNet R& D lab advise that the best way to achieve a perfect adhesive transfer is to place the printed transfer sheet and the adhesive sheet face-to-face and run them through a hot laminator before pressing on a heat press. The laminator warms the adhesive layer and drives out any air pockets the might interfere with the adhesive coat transfer. If you do this, you only have to press them once for 35 seconds. So if our tips and your best efforts don’t produce the consistency you need, you can opt for the hot laminator solution. You can get one at any big box office supply store for about $50 – $80.oo. • Flaky Residue: The second step is to press the coated Transfer sheet to fabric. This is a cold peel process with all two-step laser transfer papers. With UniNet Premium Paper, you should let it cool for under a few minutes before removing the paper. If you remove the transfer paper too quickly, you may get a clear film deposit on the transfer. UniNet suggests peeling the paper after it’s completely cool. If you still have a little residue, don’t fret. It can be gently brushed off. • White Border on Shirt: If your final transfer on the shirt has a white border, you’ve missed a step. With all two-step laser transfer papers, the first step tends to crush the edge of the adhesive paper. This leaves a line of white adhesive residue on the imaging or transfer sheet that must be trimmed before pressing the transfer to the garment. • Washed-out White: If , at the end of the process, your final transfer on a dark shirt looks washed out, or your white looks weak, you can fix this by taking a look at how you started. Make sure your art file is in CMYK mode and that your print driver is set to Office Color. 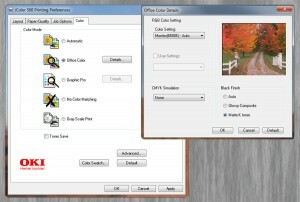 Click the Color Tab, select Office Color, and click the Details button next to it. 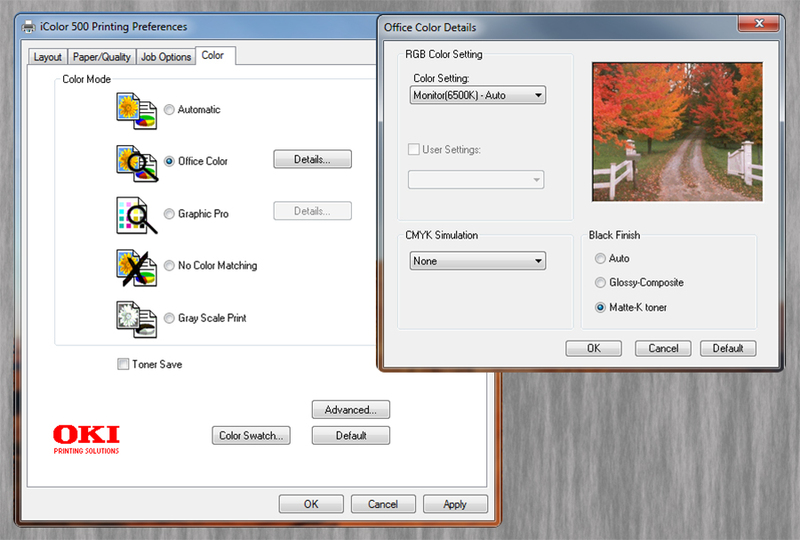 Then from the Office Color Details window, click the Matte-K toner button at the bottom of the window (Fig3). This will ensure that the printer uses CMYK instead of composite black from the Cyan, Magenta, and Yellow cartridges and that your white layer will be solid and opaque. Now you have all the insights you need to turn out stunning decorated apparel and non apparel items with your iColor 500 and UniNet Premium Laser Transfer Paper. If you think we’ve forgotten something, or if you have a question about the paper, printer, or process, please post it in the comments below.